Real estate notes can be a great investment and great way to add a revenue stream onto your real estate investing business. However, sometimes it can be hard to find motivated note owners who are looking to sell. And for those notes you want to sell yourself… what if you could have a list of note buyers ready and waiting to purchase notes you have available? 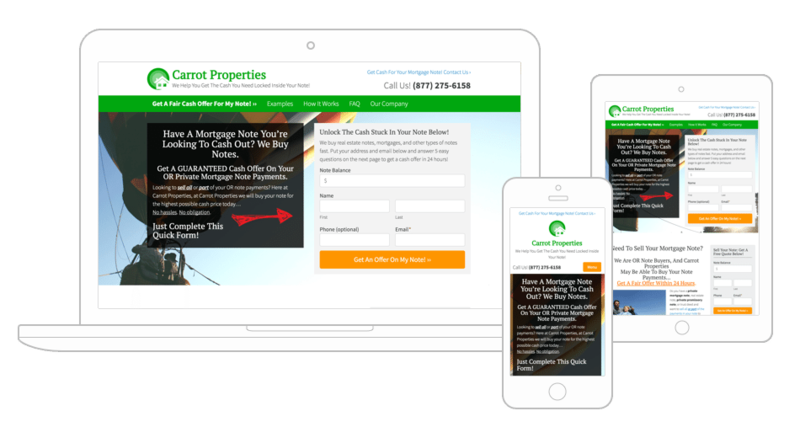 With our Note websites, you can leverage our proven inbound marketing platform to help get in front of and convert more note buyer and seller leads online. From the ground up, all of our websites and tools are built to help you as a real estate and note investor get a higher ROI. Our built in SEO tools, high converting designs, social media integrations, and property / note listing function are all 100% mobile optimized to perform well on cell phones and tablets to help you avoid losing out on leads to an underperforming website. Every day note owners are hitting the web to find reputable note buyers. Carrot helps you get in front of those sellers more easily with our built in SEO tools, our industry leading training, content marketing system and more. When you have notes that you want to sell, use our “buyers list” building features to convert and screen your buyers to save you time and weed out the tire kickers. Also, we integrate with many CRMs and email marketing systems so you can automatically send your buyer leads to other systems you already use in your business. Believe it or not, our research shows that every day note sellers are typing phrases like “note buyers in Dallas” as an example… looking for a local solution. The same goes for buyers searching phrases like “mortgage notes for sale in California”. Our built in tools and SEO technology helps give you a jumpstart on phrases we’ve found note buyers and sellers search online in YOUR local market. I’ve tried the other systems out there like Freedomsoft and REIBlackbook and neither returned any results. With InvestorCarrot I implemented the training for SEO and I’m consistently converting leads and closing profitable deals from online leads. Want To Have Note Sellers & Buyers Find You?